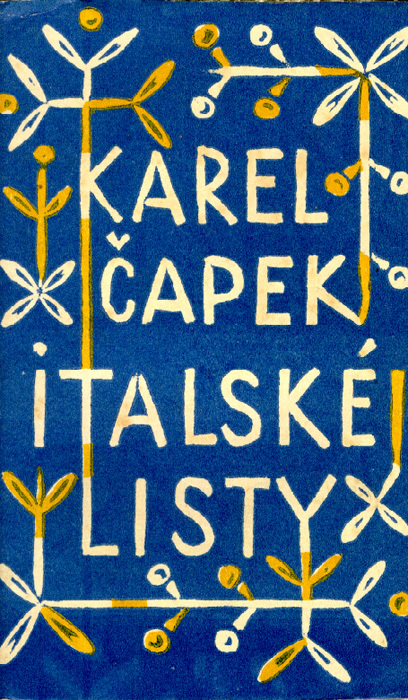 In 1923, the great Czech writer Karel Čapek published his first travel book: Letters from Italy. Having greatly enjoyed Letters from England (1924) and being now in the midst of planning my first trip to Italy, this seemed like the perfect time to read about Čapek’s travels there. Good news about my upcoming trip: there will be fewer fascists (I hope) than Čapek encountered. Needless to say, they were not the highlight of his trip. Čapek spent much of his career speaking out against dictatorships and fascism in particular, which does make one wonder why he decided to visit Italy so soon after Mussolini came into power. On the other hand, it is Italy. I can understand how its charm would outweigh any feelings of disgust for its vile Prime Minister. I, who flatter myself that I have the sense of direction, strolled round a circle for two hours yesterday. I left St. Mark’s Square for the Rialto, a good ten minutes’ walk: after two hours I finally reached St. Mark’s Square. These Venetian streets decidedly remind me of the East, clearly because I have never been in the East, or of the Middle Ages for perhaps the same reason. Paragraphs like this are the reason I love Čapek so much. Unfortunately, there are very few of them in this book. Undoubtedly in international hotels you can always make yourself understood in French: but there are places more interesting than all the hotels in the world, and there you have such a cosmopolitan babel that you cannot inquire or make yourself comprehensible or ask anyone for anything; there you rely upon people to provide you with food, drink, and lodgings and take you somewhere – how and where, that is of course in their powers and not yours, but you trust yourself to them as a dumb, helpless creature incapable of choice, self-defence, or insult. And so they give you food and drink, protection and lodging; you accept everything with a thousand-fold more gratitude than if you ordered it in a lordly, comprehensive way. On he travels but, to be honest, he moves too quickly to really observe any place very well. It’s fun to say “oh, that sounds like somewhere worth visiting” but that is not what I look for in this sort of book. I want to be charmed and entertained and, mostly, I want him to be funny in his criticisms of Italy and the Italians. He did this brilliantly in Letters from England but obviously had not quite found his style yet with this book. And what a shame – I’m sure he could have been quite devastatingly clever if he’d let loose (there are flashes of this at times). The book ends in Bolzano, which Čapek views with relief. After sunshine and arid hilltowns, palaces and museums, it is unbelievably cheering to come to a familiar landscape of mountains and forests and to see people who, until only a few years before, had been part of the same Empire as he. Travel is broadening but never more delightful than when you encounter the familiar after weeks of feeling like an alien. I’m thinking I should just spend a few weeks with Karel Capek. We all loved the gardening book (whose name escapes me at the moment) in my garden club; thanks to you, Claire. What a tumultuous time that was in the world. Not unlike what it going on now, actually. I admire his spirit and adventure. Lovely and honest review. Thank you. I like that first paragraph. I’ve got The Gardener’s Year, which is delightful, and very funny, with some very sound advice on gardening. And we read The Insect Play at school, but I don’t know anything else about him or his work – a few weeks exploration with him might be in order! What a gorgeous cover. And I have a couple select friends who prefer the “thrust yourself out into the world without making plans or learning the native language” method of travel. I’m too nervous to try it, but it always, always works out for them. I would love to read this.